It is something on the order of twenty-four new shirts*, mostly toddler and preschool sizes, hardly one of which is identical to another. I have another half dozen that are just a step or two from complete. This crib sized top is one I finished when I was pregnant with my first born! I told her it was hers yesterday and she pronounced that she was happy to turn it over to her sister... who is pretty soon going to outgrow this herself. my baby! my jelly top! It's about a foot and a half wide, by two feet tall. The circle black and white fabric is the chosen backing. 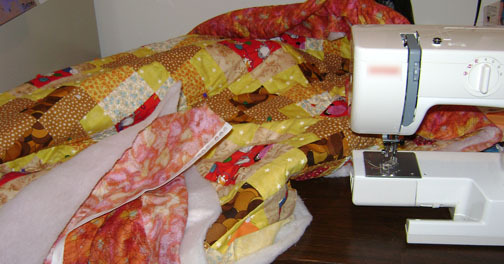 Despite my work with the machine, I will probably have to hand quilt it, because of the fabric paint. 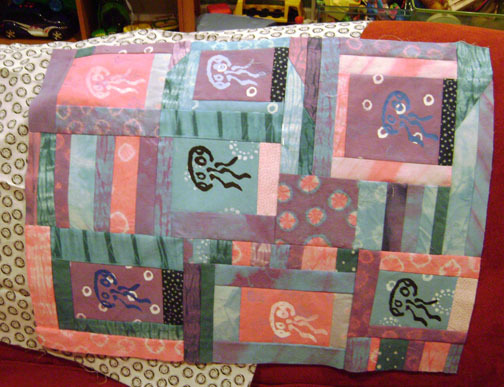 And I'm horrid at quilting (ahem, inexperienced! ), and I hate my machine's walking foot.... anyway, that way I can add beads, and use embroidery floss, which would be neat. Also, today, I replaced the pocket in one of my bags. A bit of a long story, but it's nice, sometimes, to just whip through something so straight forward... Makes a change, for sure. *I am already dreading the mammoth photography session in front of me with these. sigh.